Somehow the last half of July slipped right past me. 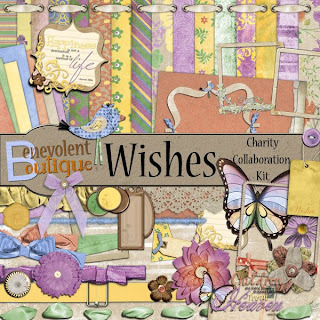 I did say last month that I didn't think I had time to really give my all to the Benevolent Boutique charity kits, but I pulled something together at the beginning of the month for one of the kits - Wishes. 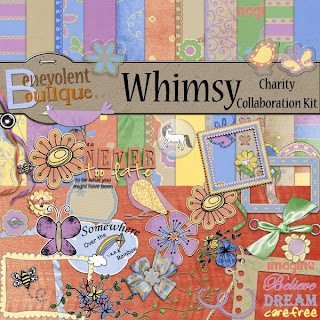 Two kits were designed, both using the same color scheme, but one was floral grungy & the other whimiscal. You can buy them here. 1) To raise awareness of the plight of children with Down syndrome in foreign orphanages and their availability to be adopted. 3) To locate new adoptive families for orphans with Down syndrome internationally. 4) To "de-mystify" the process and costs of international adoption...it IS affordable! 5) To encourage families to consider adopting a child with DS through education and financial help. 6) To offer financial assistance to adoptive families through our Sponsorship Program. 7) To participate in medical missions for urgently ill children with Down syndrome. 8) To participate in humanitarian aid opportunities to improve the quality of life of children in foreign orphanages. I got my hubby one of the memory coffe mugs for Father's Day and I love it. Here is a mug insert with a few pieces from my portion of Wishes - one with a quote relative to the mission this month and one without.